The circular saw is the undisputed king of portable power tools—the builder's sidearm. With a powerful motor and fast, rotating blade, it's there for straight, precise cuts in all types of building materials. When it comes to versatility, the circular saw is rivaled only by the jigsaw, but when you're ready for a power tool that can handle big jobs, like trimming framing lumber or rip-cutting 8-foot plywood panels, the circular saw stands alone. 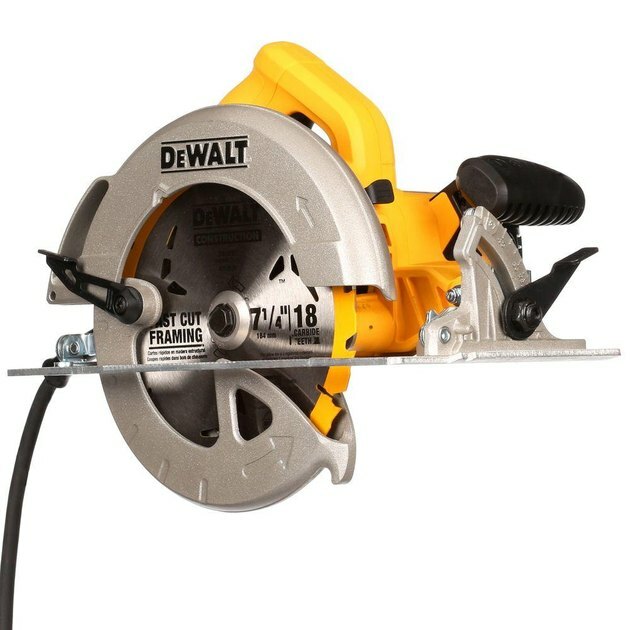 A portable circular saw is a carpenter's primary cutting tool. The reason there are so many power tools to choose from is that every tool, no matter how versatile, has its limitations. A circular has two significant entries in this "can't do" column: curves and depth of cut. Circular saws turn corners about as well as a freight train, and standard models will cut only about 2 1/2 inches deep. There are ways around the shallow cut—for example, you can flip over a 4x4 and cut from two sides—but the curve limitation has no work-arounds. If you need a curved cut, choose a jigsaw or a reciprocating saw. In the "Can Do" column, circular saws have more entries than any other tool. It's the only tool that might score a concrete driveway, halve a 2x4 lengthwise, and trim roof decking (on the roof) all in a single day. As a rotary saw, a circular saw is a lot like a handheld table saw and is capable of making straight cuts through lumber or sheet goods of any length. In fact, for homeowners who don't own a table saw, a circular saw is the primary substitute. And there's one thing that circular saws do better than any other saw: plunge cuts. This is a somewhat advanced, but easy, saw technique in which the saw's spinning blade is "plunged" (more like carefully pivoted) down into the material from above to begin interior cuts where you're not starting from an edge. A circular saw has a compact, powerful motor; a D-shaped primary handle, where the trigger is; a secondary handle for your other hand; a blade and blade guard; and an adjustable saw base that pivots or slides up and down (to set the cutting depth) and rotates to one side (to make bevel cuts). The orientation of the handle and motor characterize the type of saw: standard circular saws have the handle above the motor; worm-drive circular saws have the handle behind the motor. Standard saws, sometimes called sidewinders, have blades driven directly by the motor shaft. 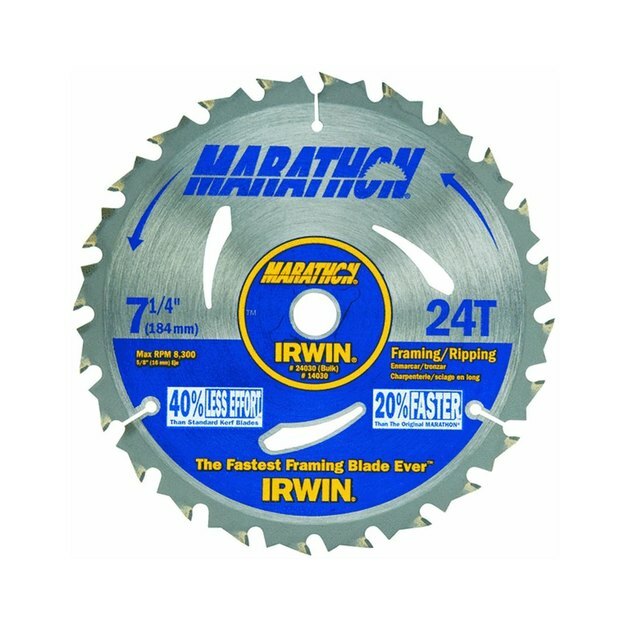 Worm-drive saw blades are driven by a worm gear, a design that gives them more torque and steadiness in heavy cuts, making these the preferred saw type for framing carpenters and other builders who cut a ton of lumber. For DIYers and most jobs around the house, a standard saw is better because it's lighter, more maneuverable and generally easier to use than a worm-drive saw. Most sidewinder saws are "right-side" and have the blade on the right side of the motor, but "left-side" models have become increasingly available. The choice of right-side or left-side blade is based entirely on personal preference. Circular saw sizing is based on the blade diameter. Standard-size saws use 7 1/4-inch blades and can cut a maximum depth of about 2 1/2 inches. Compact saws can use anywhere from 3 3/8-inch blades up to 6 1/2-inch blades. In all cases, the depth of cut is less than half the blade diameter because the blade rotates on an arbor at the center of the blade, and you can't cut all the way to the arbor. There are also larger specialty circular saws—the common 10 1/4-inch and the less common 16 5/16-inch, sometimes called a beam saw. These are professional-grade tools for production carpenters and timber-framers. Note that you can usually downsize the blade—for example, use a 6- or 7-inch blade on a 7 1/4-inch saw—but you can't use a larger blade than the saw is designed for. Smaller saws are lighter and more maneuverable than larger saws but they make shallower cuts and can have a lot less power. 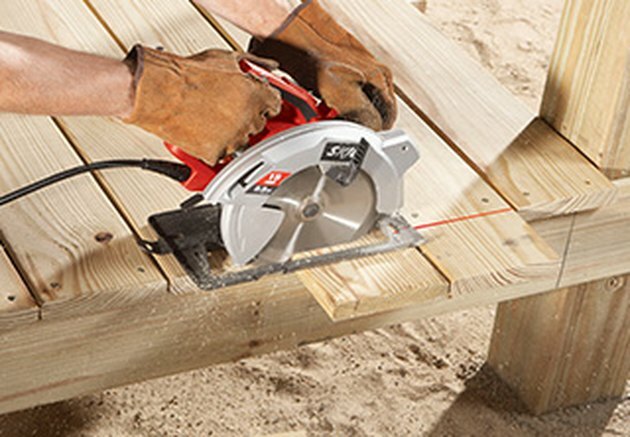 Compact saws are OK for lightweight cuts like plywood, trim and paneling or for occasional lumber cuts, but for everything else (including masonry), a standard 7 1/4-inch saw is a better choice. As the most common size, the 7 1/4-inch also gives you the most options for blade brands and types. There's a right blade for every circular saw cutting job. The all-purpose blade for wood is the carbide-tooth combination blade, which has about 24 teeth. It makes fast cuts in lumber and plywood and will also cut many metals and plastics. A finish wood blade has about 40 teeth and makes cleaner—if slower—cuts in wood than is possible with a combination blade. A panel blade makes particularly clean cuts in plywood and other sheet goods. Abrasive blades, or abrasive wheels, are inexpensive, all-purpose blades for masonry and metal, and they can also cut ceramic tile. These wear out fast, so buy extras for big jobs. The best blade for ceramic tile and stone is a diamond blade. These can be pricey but last much longer and make cleaner cuts than abrasive wheels. 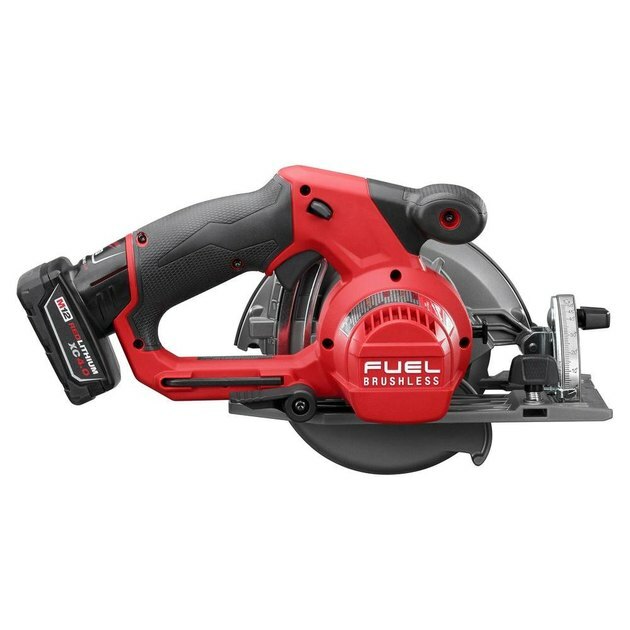 Like most power tools, circular saws come in both corded (plug-in) and cordless (battery-powered) models. The tradeoffs are very straightforward: Corded saws generally offer more power and sustained power—they don't slow down as you use them. Cordless saws offer convenience; there's no extension cord to roll out and no searching for a nearby electrical outlet. And if you need to make a few cuts in a remote location where there's no power, a cordless saw is the only option. 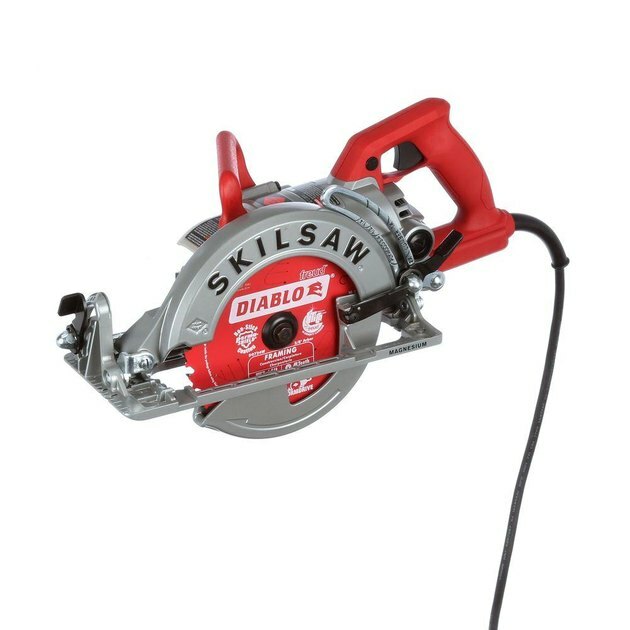 Cordless 5 3/8-inch circular saw. Corded saws carry power ratings in amps (amperes), which can range from about 5 amps for small saws up to the standard 15 amps for 7 1/4-inch saws. More amps mean more power, and power translates to cleaner, faster cuts and less wear on the blade and the user. For a standard-size corded saw, there's not much reason to go with anything below 13 amps; 15 amps is better. Cordless saws or, more accurately, cordless saw batteries, are rated in volts. The standard power rating is 18 volts. Generally speaking, more volts means more power, but there is a wide range of cutting power among tools with 18-volt batteries. In addition to voltage, batteries often carry an amp-hour rating, indicating the storage capacity of the battery, or how long you can use the saw before the battery dies. Amp-hour ratings can vary from about 5 to 9 amp-hours. Also note that some saw manufacturers offer optional batteries with higher voltages and more storage capacity.